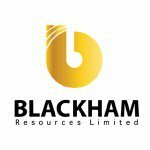 The last time The Next Mining Boom wrote about Blackham Resources (ASX:BLK), we liked what we saw. With a lot of gold companies, especially the smaller ones, the gold resource is only one part of the equation. Quite rightly, smaller companies spend several years poking around trying to prove up a resource. Good intersections, bonanza grades, and promising technical work get the market excited – but why? Long term investors don’t buy gold stocks because the companies involved find gold – they get involved because at the end of the day the company will be selling this gold. Share price movement on a particularly good assay is essentially a bet on whether or not the company’s gold will be sold at some point in time and eventually start generating cash for shareholders. There’s nothing wrong with that of course, and represents an early entry point for investors, in a potentially rewarding project down the track. BLK has a market cap of $31 million and a share price of 16c (at the time of writing). It has had several extremely promising exploration results in recent times, with high grade hits and resource extensions the order of the day. It told investors during its latest such announcement that previous modelling on one of the project’s key extensions had appeared to be conservatively modelled in the past on the back of key assay results. But here’s the thing: it could be producing as soon as the second quarter next year. At the same time, BLK is a speculative stock, and there are risks involved in investing in small cap miners like BLK. Better yet, the company is fully funded to production. We first wrote about Blackham Resources (ASX:BLK) back in May in the article ASX Junior to Unleash 100koz pa Gold Machine: Funding Now Secured , on the back of the $38.5M funding deal the company landed, which is enough to cover them all the way to production. In this article we will update you on all the latest activity happening with this emerging gold producer. But first, let’s see what a few others have been recently saying about BLK. Mr Kiley values BLK at 40 cents a share – that’s 150% more than BLK’s current trading levels. At the same time – this is based on a number of assumptions, and there is no guarantee BLK will hit these kinds of highs. Like all analysts though – these are just educated guesses based on some assumptions – reports like these aren’t the only thing we go by when making an investment. Once again, just to be clear, there is no guarantee this share price will eventuate for BLK – and investors should seek professional advice before investing in this stock. 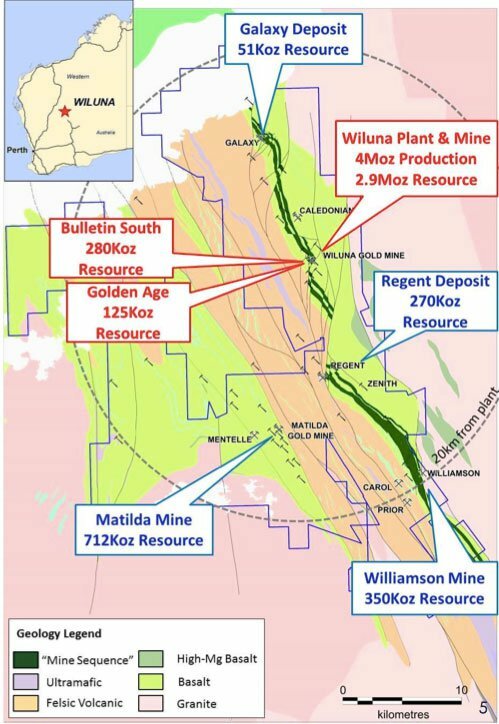 The Matilda Gold Project in the Northern Yilgarn region of Western Australia is surrounded by a regional endowment of 40 million ounces of gold, and BLK’s 780km2 of highly prospective ground gives it plenty of room to grow. Essentially Matilda is a cluster of high-grade gold resources arranged around the Wiluna Gold Plant. The big idea is to progressively bring each of the resources online, reactivate the Wiluna Gold Plant, and get first production of high-grade gold by Q2 of 2016. Currently, the entire Matilda Gold Project has a measured, indicated, and inferred resource of 44 million tonnes of ore at a grade of 3.3% gold – that’s 4.7 million ounces of gold . The first stage of production will be soft oxide and free milling, using the existing resources at the Matilda Mine, with additional gold ores coming from the high grade reefs like Golden Age, Galaxy and Caledonia. The first resource BLK will bring into production is the Matilda Mine, which has JORC inferred, indicated and measured resources of 12.5Mt @ 1.8g/t for 712,000oz. It will send the gold to the Wiluna Plant – set to produce 100,000/oz. of gold per year. Back in July, the resource estimate for Matilda received a 40% boost from the positive results of a drilling program to 7,260,000t @ 1.8g/t for 424,000oz Au. Drilling work is ongoing and Matilda could see yet more upgrades in size. 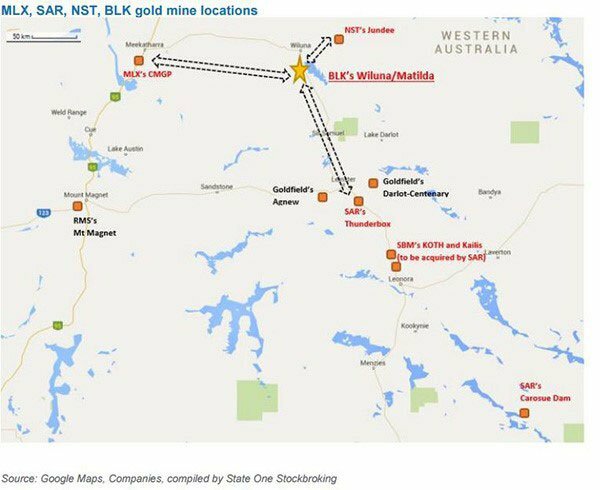 BLK’s plan is to reactivate the open cut mine, dig deeper, and define new zones of mineralisation to target through exploration to keep the Wiluna Plant churning out gold. It recently told the market that as a result of further drilling at Matilda, it had firmed up a new high-grade lode and extended mineralization at existing pits. Earlier this month it further firmed up its view of Matilda with another round of drilling identifying a number of extensions that could “expand and add further confidence to the free milling, open pit inventory” . This included adding further confidence to the base of a crucial pit, with hits such as 14.5m @ 6.74g/t from 163m confirmed the pit as a source of free-milling high-grade gold to get the Matilda up and going. At the moment BLK is working towards a Definitive Feasibility Study, drilling away to bring other resources into the indicated category – hence the regular drilling results flowing into the market right now. But even before it has a DFS in the bag, BLK has done some modelling of cash costs which caused us to do somewhat of a double-take. It has estimated that once things are up and running, that it will have cash costs between A$1000 per ounce produced and A$1,100/oz. The current gold price is roughly $1,600/oz. (at the time of writing), meaning it has a margin of between $500 and $600/oz. However caution should be applied here – the price of gold does fluctuate, and could be different when BLK enters production. BLK has estimated free cash flow at $162 million (using a A$1,500/oz gold price) over the initial four years of the Matilda Gold Project’s 10 year initial mining and processing life. With a small capex of just $25 million the project produces some very strong cash flow. 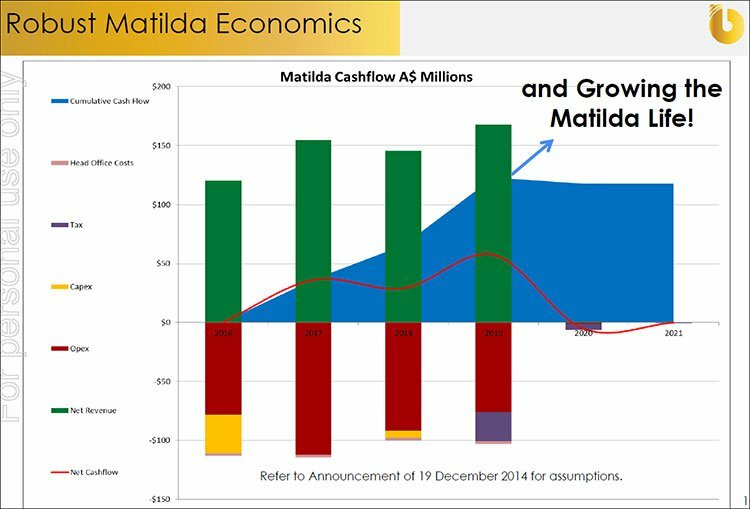 That rapid early cash flow should result in a payback on capital expenditure within just nine months . Best of all, BLK’s Matilda Gold Project is fully funded to production – the company has secured a $38.5 million funding package from Orion Mine Finance, a mining-focused investment business managing over $2 billion of funds. Under the terms of the deal, BLK gets a $2.5M private placement, a $6M initial loan, and a further $30M once the DFS has been completed. This is a true turnkey operation – BLK can mine and process its own ore into high purity gold using the Wiluna Gold Plant, prior to refining into LME grade 99.99% gold bars at the Perth Mint. While Matilda will provide the initial free-milling ore to get the Wiluna Gold Plant up and running, the broader project has been envisioned as a staged development, with other mines such as Galaxy, Golden Age, and Williamson coming on stream later in the process. Recent drilling has focused on the Galaxy and Golden Age deposits. Initial assay results at Golden Age bought up a bonanza grade hit of 5.1m @ 198 g/tonne . The rest of the assay results confirmed the high grade nature of the Golden Age Reef and that the system was still open. * 2.2m @ 18.9 g/t including 0.8m @ 42.1 g/t . BLK Managing Director Bryan Dixon said the latest set of results demonstrated BLK now has more gold on its hands than it previously thought . “The drilling at Golden Age has confirmed our understanding that this deposit has significantly further high-grade potential, that remains open, and has previously been conservatively modelled,” he said. The higher grade Golden Age ore will be blended with Matilda open pit ore to increase the head-grade of the mill feed. Galaxy has also been producing some high grade results. At the moment, BLK is at the Pre-Feasibility phase on the Galaxy Mine, but as it is just 13km away from the Wiluna Gold Plant, it’s shaping up as a valuable source of feedstock as the plant starts to ramp up production. At the end of August, BLK released the latest drilling results at Galaxy . It had drilled four holes at the pit shell area in order to give it confidence that it was on the right track. Suffice to say, hits including 2.5m @12.84g/t from 80m, 3.6m @ 6.39g/t from 35.1m and 7.5m @3.14 g/t from 7.8m did just that. The results effectively firmed up BLK’s theory that the high-grade Galaxy deposit starts from the surface – meaning more cost-effective mining. What’s more, BLK said these results combined with previous drilling meant that “high grade shoots are stacked, flatter lying and have greater strike extensions than previously modelled”. In other words, it has more gold on its hands at Galaxy than previous thought. A further drilling program is currently in the works at Galaxy, which is being designed as a testing program of an eastern extension – meaning there could be more for investors to chew on in the not-too-distant future. Is BLK a takeover target? It ran the rule over gold transactions in the past two years to try and get a baseline on what the gold sector was looking like. It came up with an average transaction price of $46 per ounce resource on the projects acquired in the past two years. Remember that BLK’s project has a potential total resource of 44 million tonnes of ore at a grade of 3.3% gold , meaning a potential 4.7 million ounces of gold . With a market cap of $31.8 million and a resource of 4.7 million ounces of gold, BLK has an implied value of $6.38/oz. Compared to the average transaction price of $46/oz., BLK starts to look like an absolute bargain. For potential buyers, a cut-price potential acquisition and for investors, plenty of upside. At the same time, there is no guarantee of any offer ever eventuating for BLK, and this should not be taken as a sign its share price will rise. 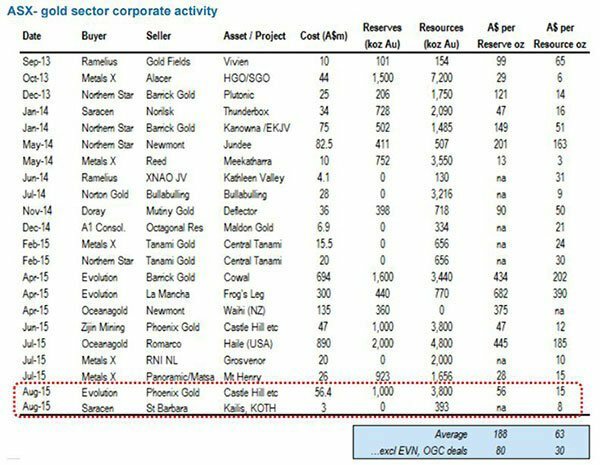 State One’s report said that the most active acquisition players in the north of WA were Metals X (ASX:MLX), Saracen Minerals (ASX: SAR) and Northern Star (ASX:NST). It looks like BLK’s project is in the middle of three hungry sharks, and with BLK firming up both resource and project economics by the day, The Next Mining Boom may not be the only ones taking a closer look at BLK. BLK is doing everything right at the moment. But it’s still a speculative stock and caution should be applied before investing. BLK is drilling in order to firm up its resource at its flagship Matilda Gold Project, and has near-term production on the menu. Normally gold companies either have regular releases of promising drilling information going onto the market OR near-term production it’s getting ready for. Rarely does a company have both. Better yet, BLK is fully funded to production. Thanks to BLK’s strategy of picking up a quality asset from a distressed owner and giving it the once over, it has managed to build a near-term proposition not normally associated with a company of its size. Meanwhile, it continues to drill, with each fresh set of assay results having the potential to up its resource size further still as it heads to a Definitive Feasibility Study. But either way BLK has a clear path forward toward commercialisation and cashflow. It should pay back the capital costs associated with the project within nine months . Not too many small ASX-listed companies can say that with any certainty. With drilling results continuing to firm up and extend the resource at Matilda, investors have both a long-term production plan to looks forward to and shorter-term drill hits to maintain interest.